Purina’s Wind and Rain® Storm® Fly Control mineral with Altosid® (Insect Growth Regulator) prevents the breedering of horn flies in the manure of treated cattle. 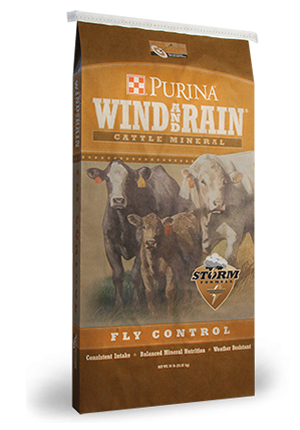 Wind and Rain® Storm® cattle minerals’ large particle size and special formulation keeps the mineral from absorbing water and blowing out of the feeder. Exclusive Storm® technology provides the ultimate in weather resistance to reduce waste and makes Wind and Rain® Storm® Formula more economical to feed than conventional loose minerals.